The next time you change your existing garden or build a new one, consider balancing its design and the time you can commit to maintenance. Think about the function and features that you want in your garden. Would you want a lawn? How about a deck? Do you want to grow certain plant species? Then, ask yourself how you’re going to take care of these garden features. 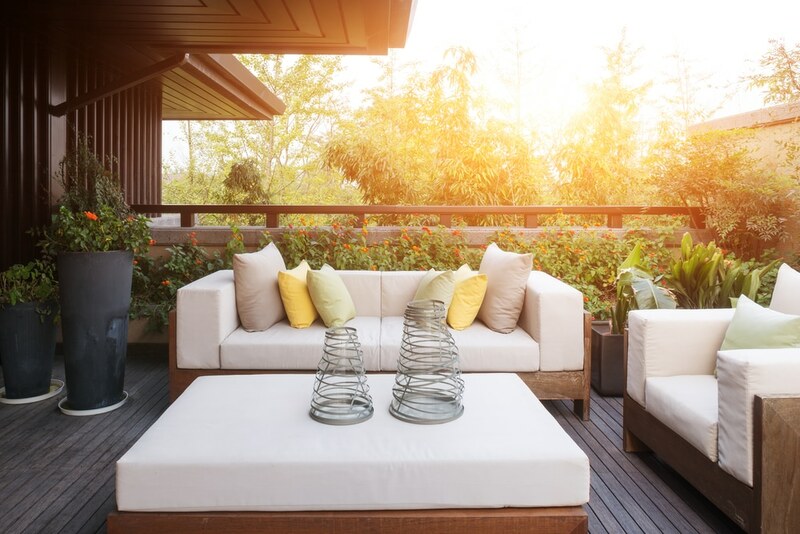 Understanding your priorities and lifestyle will help you build an outdoor space that suits you. There are three main areas to consider in your outdoor space design: the hardscape, the lawn, and the plants. The decisions you make with regards these three are the key to building a low-care outdoor space. These are the solid walls, timber decks, or floors made of brick, stone, tiles, or concrete. These hard surfaces are for establishing areas for relaxation and entertainment. The more hardscape features you have in your outdoor space, the easier it is to maintain. It’s possible to have large areas of it, but the building would be costly. If you have a small garden, then converting the whole area will not be a bad idea. You can cover the entire area with a harder and stronger underfoot. Yes, the initial costs are tremendous, but you will enjoy a nearly maintenance-free outdoor space for a long time. All you have to do is sweep, power wash, and stain the surface when needed. To avoid having a garden that looks like a concrete jungle, consider matching the size of the hardscape with its function and your lifestyle. 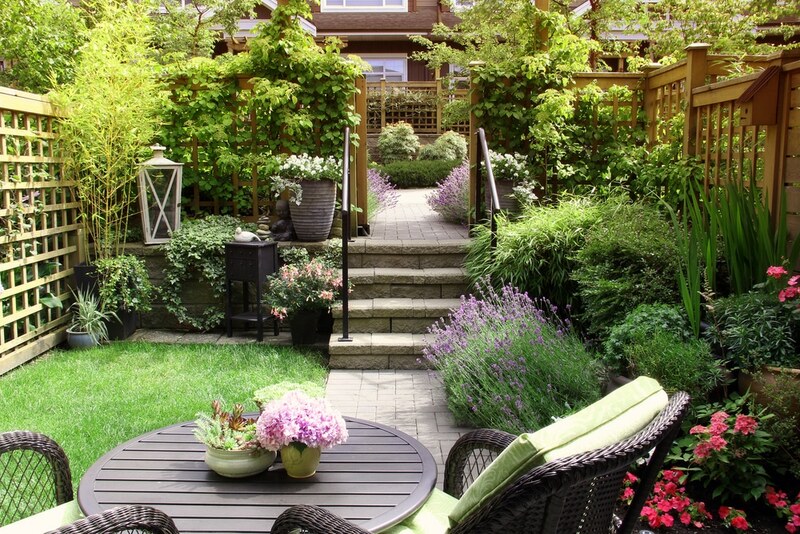 Establish the use of your outdoor space in as early as the planning stage. You will most likely need to solidify the floors of your outdoor living and the areas around your pool/fountain etc. Stunning hardscape design also involves mixing and matching building materials. This is to have an interesting combination of colours, tones, and texture in your landscape design. Here, you’ll see how concrete, stone, and lush plants work together in the garden. The use of two different stones (pavers and gravel) are noteworthy too. When using gravel, use a soil barrier to prevent weeds from growing through it. Contemporary garden with decorative grass, concrete and stone details. Brick pavers and timber decks are flexible, low-care hardscapes too. You can pair them together or it with other building materials for added interest and texture. 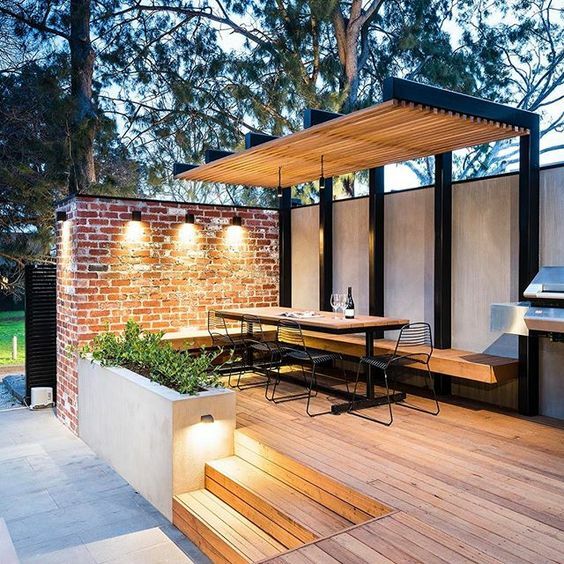 Elevated deck with brick walls and timber batten cover. However, decks require strict maintenance to keep it safe and beautiful. 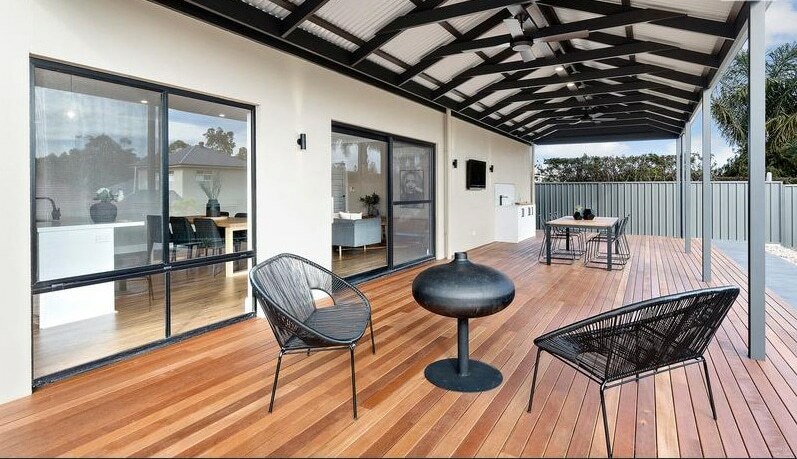 Direct exposure to the elements affects the structural integrity of timber decks. Clean it as often as possible. Don’t let it become dirty and grimy or else it will rot. Always check for possible repairs especially in areas close to the ground, pipes, and water sources. Restain it during late spring, just before the weather turns warm and dry. Outdoor space with deck, lawn, green wall, and covered pool. After planning the hardscapes, it’s time to inject the greenery. You can have a tiny lawn like in the featured garden above. 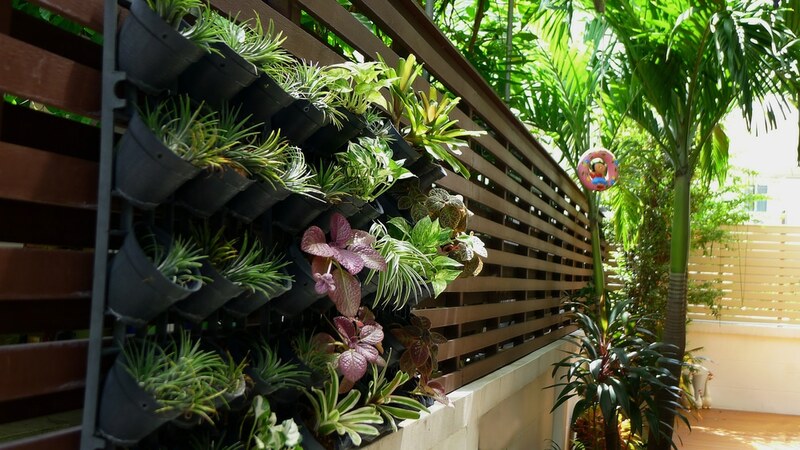 Don’t forget to grow lush and flowering plants on the side to enhance the space. Plants are living things and need maintenance. But, you can have a beautiful and low-care landscape with careful selection of species. Settle them in the right place to lower the maintenance requirements too. When unsure of which plants to choose, refer to the suggestions of a local gardener or Horticulturist. Ask him/her about the plants native to your region. When the plant suits your soil and climate conditions, the higher chance that it’ll thrive on its own and will require less attention. You also need to ask the gardener or Horticulturist about plant’s height and size once it matures. Never go for a plant that can take over your space, unless you can dedicate time for pruning. 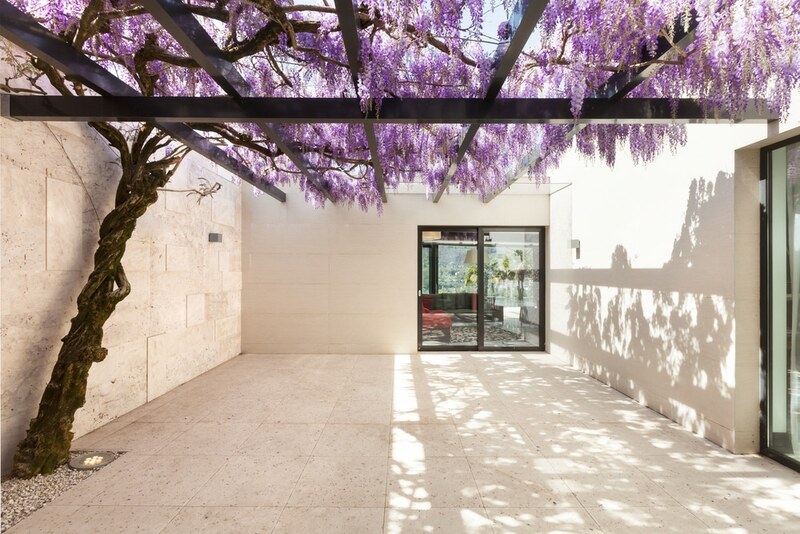 Wisteria climbs above the concrete backyard, providing shade. The kind of plants you choose will affect your maintenance routine. If you have vines and climbers, you need to provide a truss or any support. If you have herbaceous perennials, be prepared to clean dead foliage at the end of the season. Most of these species are deciduous, meaning their leaves fall off a few times in a year. To avoid these maintenance blitzes, reduce the number of herbaceous perennials in your garden. Mix in evergreen substitutes like shrubs. Unlike most perennials, shrubs offer year-round flowers, leaves, and fruits. Berries, for example, is a shrub that will liven up your garden through all the seasons. 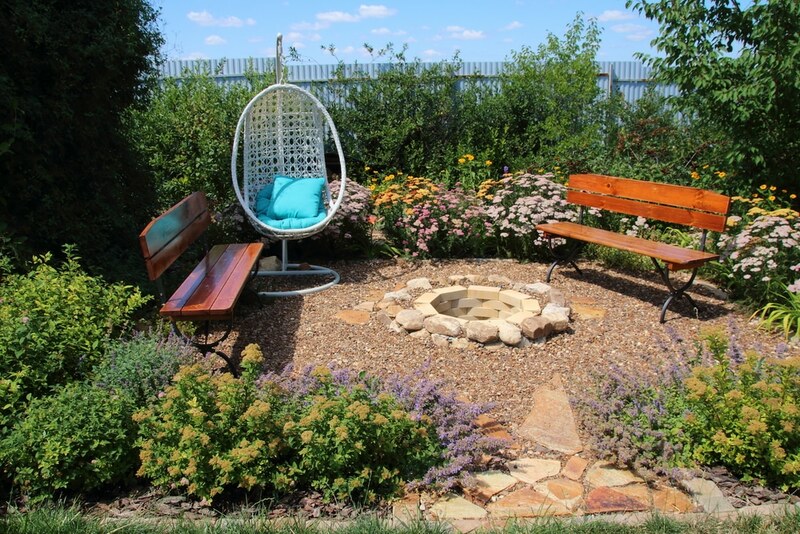 Garden with a hanging chair, bench, and a fire pit surrounded by blooming flowers and ornamental shrubs. When choosing shrubs, go for the ones with staggering growth and flowering periods. That way, pruning can happen over any season. To minimise the growth of weeds, consider ground cover plants. Make sure the bed has a weed-suppressing membrane in it. Afterwards, cover the bottom with mulch. The mulch will keep the weeds from holding on to the soil. It will also prevent too much water evaporation. Meaning, there’s less need for watering the plants. 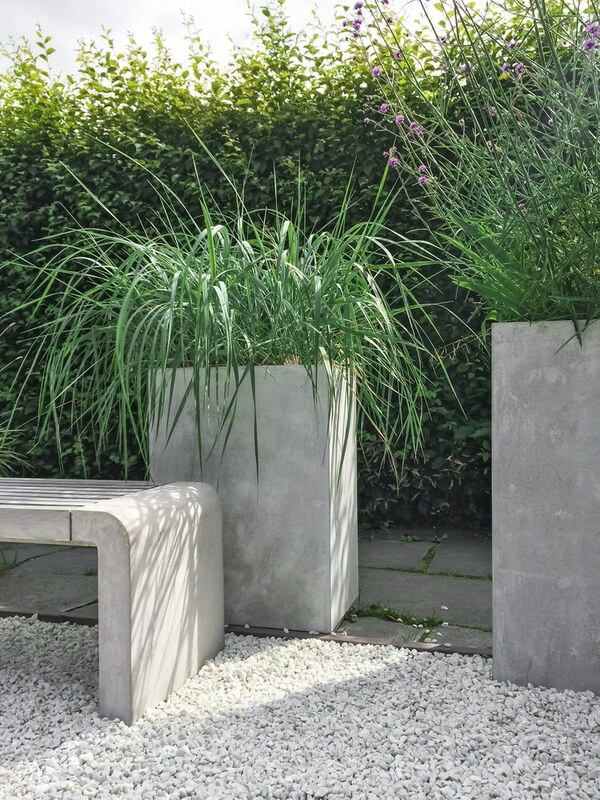 If you have a large hardscape area, planted containers are most likely part of your design. A little warning tho: this will require a lot of work. You have to plant, feed, water, and transfer the plant to a bigger pot when it outgrows its current container. It’s best to use the largest one which can accommodate your growing plant. Forget about seasonal plants too. They might give lively and attractive colours, but you need to replace them every season! A low-maintenance garden has evergreen shrubs, perennials, and herbs. These will thrive despite the little attention you give them. One flowering plant decorates this deck. Some are in planter boxes while others are in huge pots. Lawns are the most time-consuming feature in your outdoor space, so going for it is an unusual choice if you’re building a low-care garden. It’s labour intensive! However, lawns are treasured features of homes with children and pets. And, depending on your location, having a green lawn is inexpensive than building hardscape backyards. With careful designing and planning, you can make a lawn work even if you’re a time-strapped homeowner. Small lawn surrounded by perennials and shrubs in bloom. 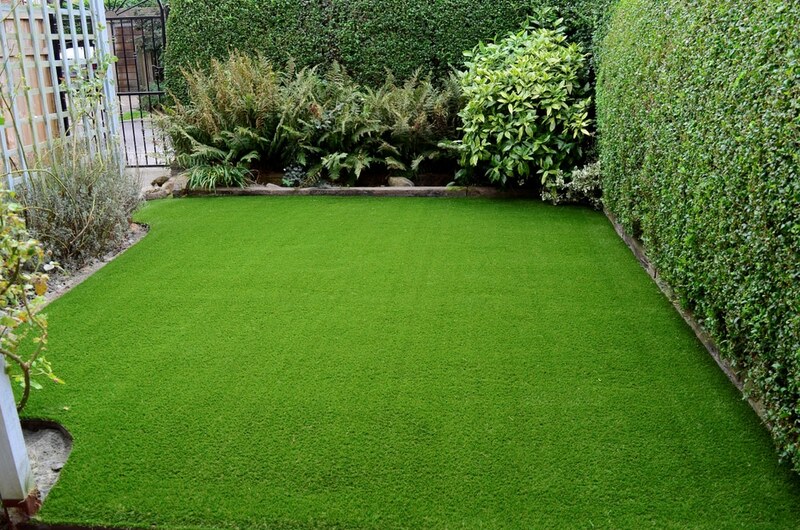 The first thing to do is to cover a portion of your garden with turf. As said earlier, you need to mix different materials and textures. Lawn works well with gravel, concrete, stones, brick, or timber decks. Find out which pair will work for you and your space. Second, don’t mow your lawn too much. Allow the grass to grow a little higher before cutting it. This promotes a stronger root system. A mulching mower can help you with this. Also, this type of mower chops the trims before shooting it back to the lawn. The clippings act as fertilizer, providing extra nutrients that your lawn needs. When you don’t have time for mowing but still want a green garden, consider using artificial turf. Architects first used these in sports stadiums. Now, there are varieties that fit residential use. It resembles real grass! Similar to hardscapes, laying fake grass is costly and requires upfront payment. But, this won’t ask you to water and mow, pull weeds, and use fertilizers. Artificial lawn covers most of the backyard. If you don’t like artificial grass, consider low growing plants. These are cheaper alternatives to lawn, plus it doesn’t require much maintenance. You don’t have to mow it, but you need to pull the weeds that shoot beside the plant. Think about how you’re going to balance your time and your garden’s design during the planning stage. Name the tasks you can do for your garden. That way, you can still enjoy a blooming garden even with a busy lifestyle. We are the largest team of architects in Australia and New Zealand, who offer end-to-end design services. We can take care of your home and landscape design for you. Don’t hesitate to inquire our architectural design services. Also, if you liked this article, please follow Superdraft Australia on Facebook, LinkedIn, and Instagram.